The recent reinstallation of the J. Paul Getty Museum’s antiquities collection at the Getty Villa provided a great opportunity for the conservation team to take a closer look at each object. Examining artifacts prior to display is essential for understanding their stability and condition. 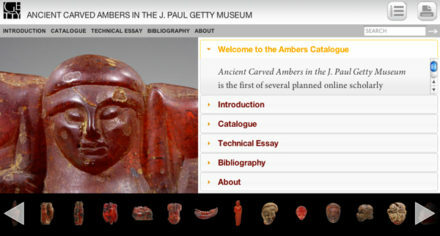 It’s also a good time to update our analytical records and take new images for documentation. One particularly interesting object that came into the lab to be prepared for installation is a Villanovan situla, or bucket, dating to the later eighth century B.C. Made of copper alloy, this situla is a fine example of decorative metalworking techniques. Our analysis focused on how it was originally made as well as its current condition, which helped us determine a plan for treatment and display. The Villanovans, an Iron Age culture that occupied northern and central Italy just before the Etruscans, excelled in the production of bronze artifacts, especially armor, jewelry, and a range of domestic artifacts. A hallmark of both cultures is the situla, a multipurpose vessel used in households, as well as for cremation burials in tombs. Several features of the situla, such as the twisted rod handles and the pattern of raised rivets, are commonly found on comparable examples from Iron Age Italy and northern Europe. Even though this bucket may have been a mundane object, its features reveal a level of skilled craftsmanship that goes far beyond utilitarian needs. To further our understanding of the object, we had some research to draw on: in 2002, it was examined by a former Getty intern, Sanchita Balachandran. Thanks to the extensive X-ray imagery she completed, unseen aspects of its construction had become visible. 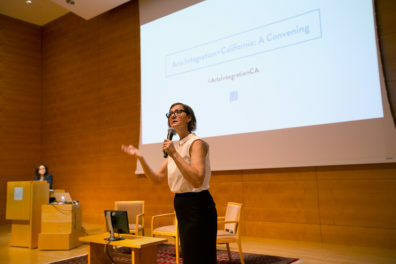 Curator Claire Lyons also compared notes with curator Benton Kidd on the twin situla at his institution, the Museum of Art and Archaeology at the University of Missouri. The Missouri situla was allegedly found at the Etruscan site of Vulci, a center of artistic metalwork. Both examples of this rare form were known to scholars in the 1960s, but only recently has scientific analysis been done. The body of the situla is made from a thin metal sheet wrapped into the vessel shape. 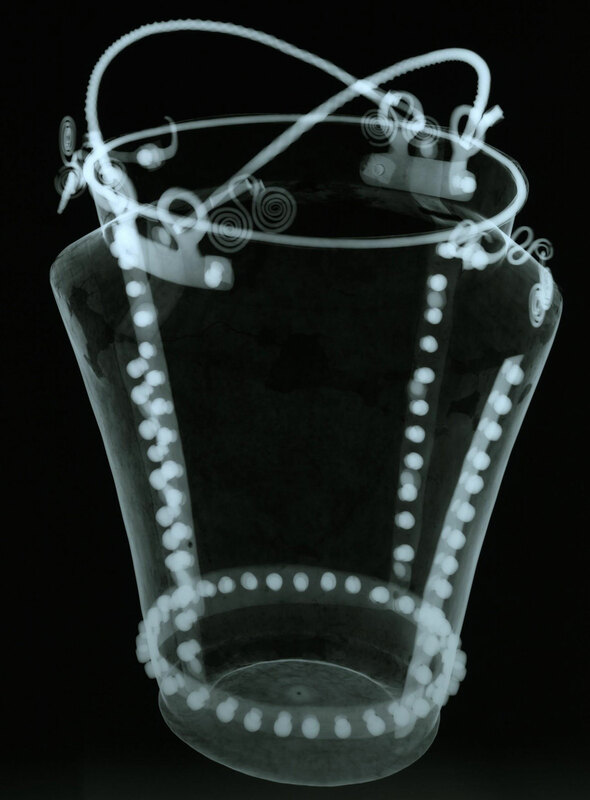 The bottom of the vessel, as seen in the X-radiograph, is made from a separate sheet that overlaps underneath a band of raised rivets. At the rim, we can see that a circular ring establishes the shape of the vessel’s opening. The thin metal sheet of the vessel walls wraps around this rod, hiding it from view. Interestingly, the distinctive rivets running down each side and around the bottom of the bucket are not all what they appear to be. One side has functional countersunk rivets along the seam, which attach the overlapping metal sheets together. The more prominent pan head rivets, which are raised like studs above the surface, turned out to be purely ornamental. This discovery shows that style and form, in addition to functionality, were important concerns to the metalworker. To complement the 2002 analysis, we re-examined the object to better understand its current condition. The situla had previously undergone extensive repairs. Just looking at it under visible light showed several types of adhesive residues from past treatment attempts. We used ultraviolet light to locate areas of aged adhesive. This technique uses a light source with a shorter wavelength than visible light, which can induce fluorescence in materials such as coatings, adhesives, and certain colorants on artifacts. Images can then be captured using a camera equipped with a specific lens filter. 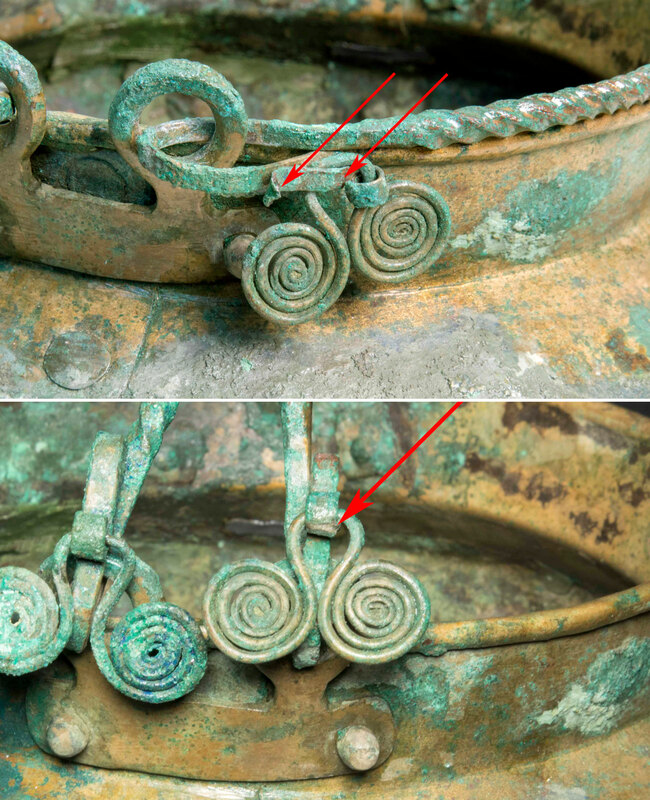 In the image below, traces of adhesive and fills are recognizable by their bright white fluorescence, particularly around the pendant spiral ornaments. We can also see a significant amount of dust on the surface, which emphasized the need for surface cleaning. 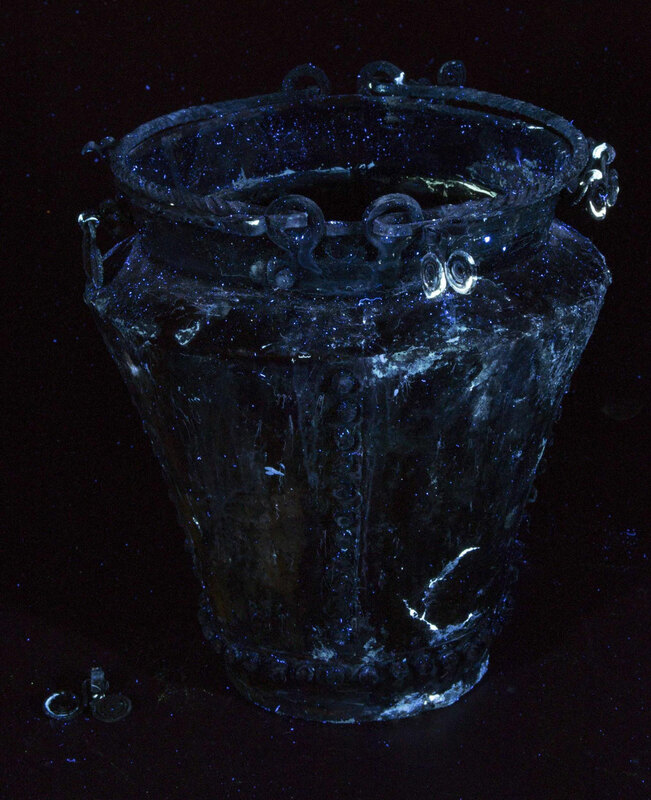 The situla under ultraviolet light (365 nm). The areas of bright white fluorescence indicate aged fills and adhesive. After gathering information about the object’s condition from imaging analysis, we decided on a plan for treatment. The object was in fairly stable condition due to previous conservation efforts. With copper alloy objects, it is essential to look carefully at the metal for any signs of active corrosion. 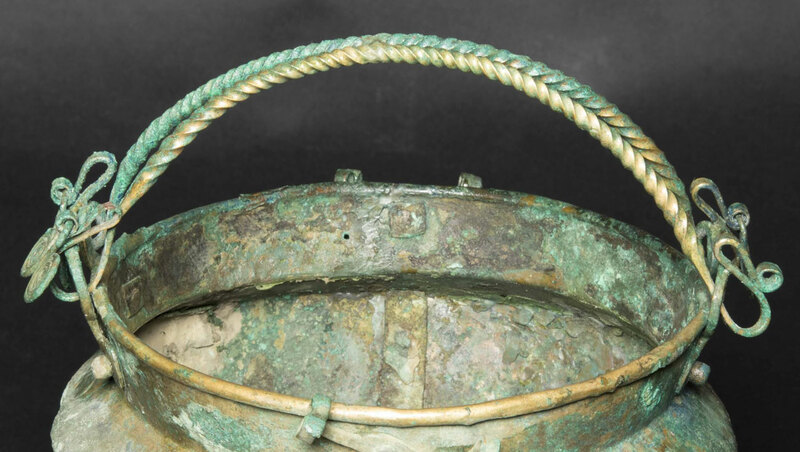 Pale green, “fluffy” corrosion products may indicate a type of rapid corrosion often referred to as “bronze disease.” Our situla, fortunately, exhibits a stable layer of corrosion products and no signs of chemical instability. Even when their surfaces appear stable, copper alloy objects are kept in low-humidity environments to minimize new corrosion activity. One way to accomplish this is by incorporating dehumidifying silica gel, which acts as a desiccant, into exhibition cases. The case for the situla contains a built-in compartment for silica gel that helps maintain an appropriate environment around the object. Thanks to the examination under visible and UV light, we were aware that different types of adhesives had been applied to joins, or repaired breaks, on the situla. Some had a visually distracting color and sheen. Inappropriate adhesives are often addressed by undoing old joins and replacing the material with a better alternative. In the case of this situla, however, reversing any joins in the fragile vessel walls would likely lead to further breakage. To minimize chances of damage, we decided to remove excess adhesives where they were visible and to tone small areas of loss with acrylic paint as necessary. This method allowed us to maintain the structural integrity of the object and touch up its appearance for the reinstallation. Many issues related to old breaks, such as the pendant spiral ornaments, also called for attention. One spiral pendant had fully detached from the rim, and another was incorrectly attached to a handle. To fix the latter, we first carefully unhooked the ornament from its incorrect placement. We found its original location by matching the break edges and observing where they joined. To reattach it, we chose Rohm and Haas Paraloid B-48N, an acrylic resin adhesive that conservators favor because it is easy to remove yet stable over the long term. Despite this reliable adhesive, the spiral ornaments needed further support to prevent the joins from breaking again in the future. A great way to introduce minor supports for metal joins is by applying Japanese tissue paper, which is strong and easily toned to match surfaces. With this method of support, we were able to use minimal adhesive and maintain the free movement of the dangling handle ornaments. Detail of a pendant spiral ornament before and after treatment. Top: Before treatment, the ornament is improperly attached to the handle by hooking onto the loop. Arrows highlight the break edges. Bottom: After treatment, the ornament now hangs in the correct position. The arrow shows the new join. In addition to the condition of the object, another consideration for a treatment plan is how the object will be displayed. With the curator, we discussed the favored orientation for the situla in the exhibition case. To emphasize its function, it was decided that the pair of handles should be displayed vertically. We first checked whether the handles and rim were stable enough for this position. After determining that the handles were in good condition, we then explored ways to support them. External mounts are often used to help display and secure objects, but we found that the lightweight situla handles could be supported without added external material. We used monofilament, or fishing line, to tie the handles together at the center. Japanese tissue was then applied over the monofilament for additional stability. We also attached small strips of Japanese tissue at the ends of the handles, which added support for the upright position. As on the spiral ornaments, each tissue strip was then inpainted with acrylic paint to reduce visual distraction. Another benefit of using Japanese tissue is that although the supports visually blend in with the object, future conservators can readily locate them. Detail of the handles with Japanese tissue supporting an upright position. The reinstallation of this striking Villanovan situla gave us a chance to assess its condition, review previous research, complete new imaging, and touch up the appearance of the object. 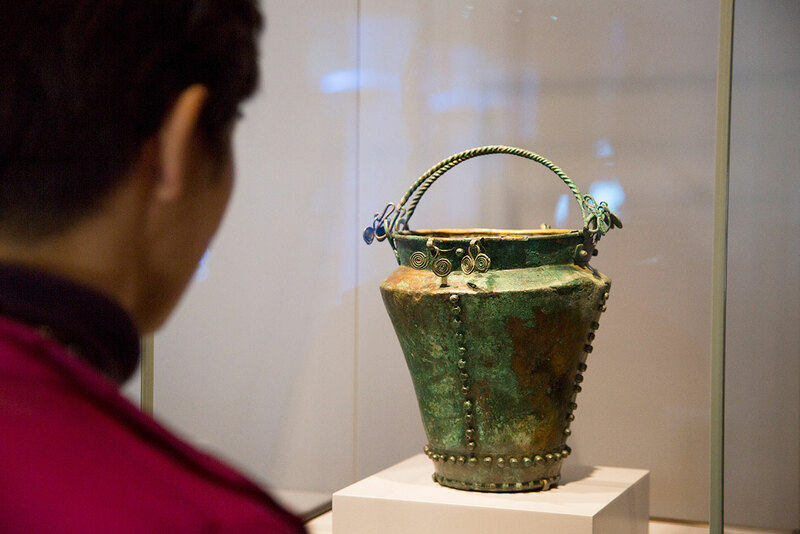 See the situla for yourself in the new Etruscan gallery (Gallery 110) on the first floor of the Getty Villa, and appreciate the sophisticated metalwork of this fascinating object up close.